Ayrshire secured the West Division title by beating Lanarkshire 5 1/2 - 3 1/2 on the third day of the West Division Inter County Match Week. They built on the 2-1 lead from the morning foursomes winning the afternoon singles 3 1/2 to 2 1/2. Most of the matches were very close. Jenny Linklater secured the first of the afternoon points with an 8&7 win over Emma Caddow. Lesley Hendry who was one up playing the last only managed to secure a halved match after her opponent Fiona Norris sunk her putt for a birdie 3 to win the 18th. This brought the overall total to 3 1/2 and only 1 point was required to ensure a halved match overall and secure the West Division title for Ayrshire. Connie Jaffrey playing in her first Inter County Match week also 1 up coming down the 18th secured the point with a win on the 18th resulting in her beating Susan Wood 2 up. However Ayrshire didn't settle for the half and Catherine Malcolm secured the winning point with a 3&2 win over Lanarkshire captain Lesley Lloyd. In the other two matches Rachael McQueen lost to Rachael Taylor 3&2 and Alex Glennie lost to Angela Devine 2down. 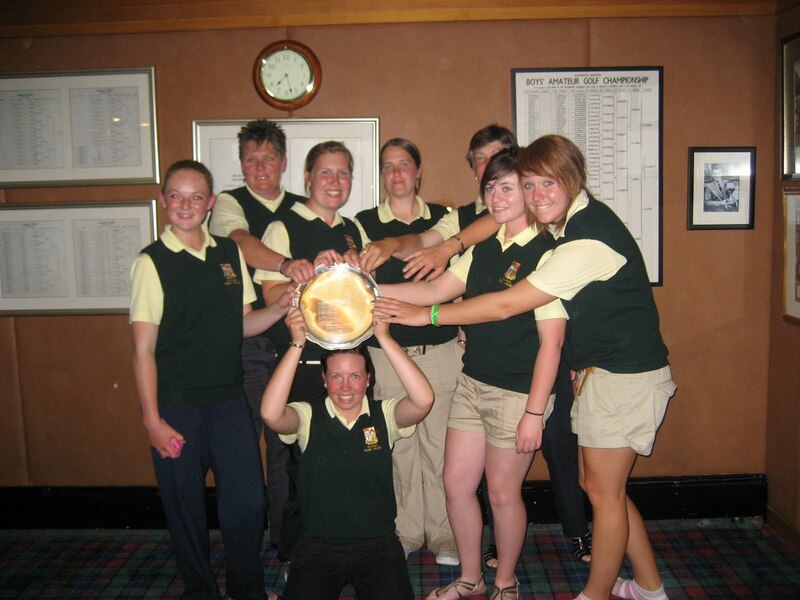 In the other match between Dunbarton and Argyll and Renfrewshire, Renfrewshire made a comeback from being 3-0 down after the foursomes and won the singles 6-0 resulting in them beating D&A 6-3 overall. Dunbarton and Argyll 0 points. Ayrshire will now represent the West Division at the county finals to be held at Dumfries and County Golf Club from September 16th -18th. We would like to thank everyone who has supported the team over the last three days especially the trolley pullers and spectators. Ayrshire have continued their winning form with a 2-1 win over Lanarkshire in the morning foursomes. Please come and support the team in your Green jumpers. Ayrshire have continued their good form on the second day of the Inter County Matches with a 2-1 win over Renfrewshire in the morning foursomes. In the other matches Lanarkshire are leading 2-1 aginst Dumbarton and Argyll after the morning foursomes. 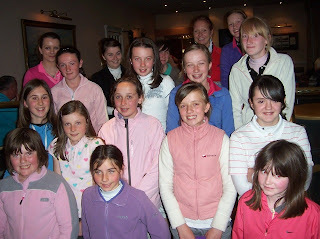 The photograph shows some of the girls who took part.